Children, teenagers, even adults like to create and tell others scary stories adding to them details, changing a tone during storytelling. 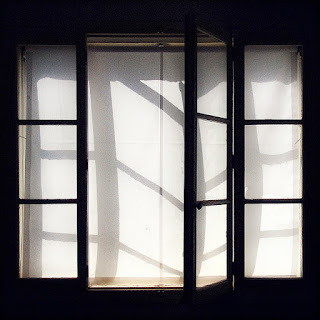 The short story "The Open Window" by Saki represents that sort of entertainment. The story tells us about the main character, Framton Nuttel, who came to a rural area to heal his nerves. His sister gave him letters of introduction to some of the people there. When he came to the one house, the niece of the hostess met him suggesting that he waited for her aunt. They had a typical small talk and after she understood that he was a stranger, the niece pointed to an open window and told Nuttel a story. "In crossing the moor to their favourite snipe-shooting ground they were all three engulfed in a treacherous piece of bog. It had been that dreadful wet summer, you know, and places that were safe in other years gave way suddenly without warning. Their bodies were never recovered." "Poor dear aunt", the niece said adding some details about "her husband with his white waterproof coat over his arm, and Ronnie, her youngest brother, singing 'Bertie, why do you bound?' as he always did to tease her, because she said it got on her nerves"
She finished her story that she "get a creepy feeling that they will all walk in through that window - "
It looks dramatic, doesn't it? "he told me he had a horror of dogs. He was once hunted into a cemetery somewhere on the banks of the Ganges by a pack of pariah dogs, and had to spend the night in a newly dug grave with the creatures snarling and grinning and foaming just above him. Enough to make anyone lose their nerve." As soon I had finished reading this story, I remembered my experience in telling such sort of stories in my childhood. It happened in a summer camp for children. My friends asked me to tell a story before we felt asleep and I told them "The Hound of the Baskervilles" by Arthur Conan Doyle. At a certain moment I lowered my voice and said: "They suddenly had heard a sound ... Uuuh! It was a miserable howl of an unknown creature!". I remember that one of my fellows told me that he had been afraid even to go outside at night because he had been so impressed listening to my story.